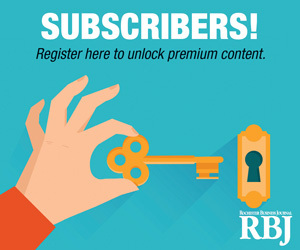 Complete access to news articles on rbj.net is available to Rochester Business Journal's subscribers who are logged in. Subscribers may login at the login tab below. Others may join our audience with a subscription today. Your subscription includes one set of login credentials for your exclusive use. Security features have been integrated on this site: If someone signs in with your credentials while you are logged in, the site will automatically close your ongoing login and you will lose access at that time. To inquire about group subscriptions for your organization, contact Tracy Bumba. If you feel your login credentials are being used by a second party, contact customer service at 866-941-4130 or email circulation@rbj.net for assistance in changing your password.